Love those flowers. That tells me you have taste ... and taste means there are nice things inside. Those yard toys your kids leave out always make me wonder what type of gaming system they have. It's raining, you're fumbling with your umbrella, and you forget to lock your door-understandable. But understand this: I don't take a day off because of bad weather. I'll break a window to get in, even if it makes a little noise.. If your neighbor hears one loud sound, he'll stop what he's doing and wait to hear it again. If he doesn't hear it again, he'll just go back to what he was doing. It's human nature. 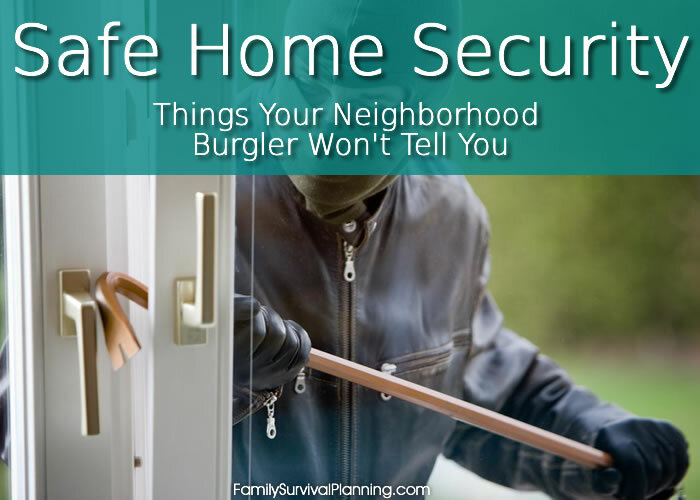 Sources: Convicted burglars in North Carolina , Oregon , California , and Kentucky ; security consultant Chris McGoey, who runs crimedoctor.com; and Richard T. Wright, a criminology professor at the University of Missouri-St. Louis, who interviewed 105 burglars for his book Burglars On The Job. If you don't have a gun, here's another way to wreck someone's evil plans for you. A friend who is a receptionist in a church in a high-risk area was concerned about someone coming into the office on Monday to rob them when they were counting the collection. She asked the local police department about using pepper spray and they recommended to her that she get a can of wasp spray instead.